NOW HIRING CLASS A MECHANIC & AUDIO TECHNICIAN! At The Shop, we offer a full line of aftermarket accessories to enhance the look of your vehicle. 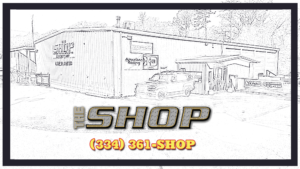 Whether it’s an interior or exterior accessory you are looking for, we are your one-stop shop for all of your vehicle needs. We carry parts and accessories from several aftermarket auto parts manufacturers, and with more personalization choices than ever, we are eager to share our expertise and resources to customize your vehicle and give it a personal touch! We offer a vast variety of options for your car, truck,and even boat. Whether you want to just upgrade your factory speakers, or you want to replace your back seat with a 24″ Jackhammer we offer it all. Want new tower speakers for your boat? We offer those as well. At the moment everything is considered as a special order because we offer such a wide variety of products, and everyone has different preferences, it would be hard to stock anything. Please come in and see us and see what we can do for you. You will not be disappointed.